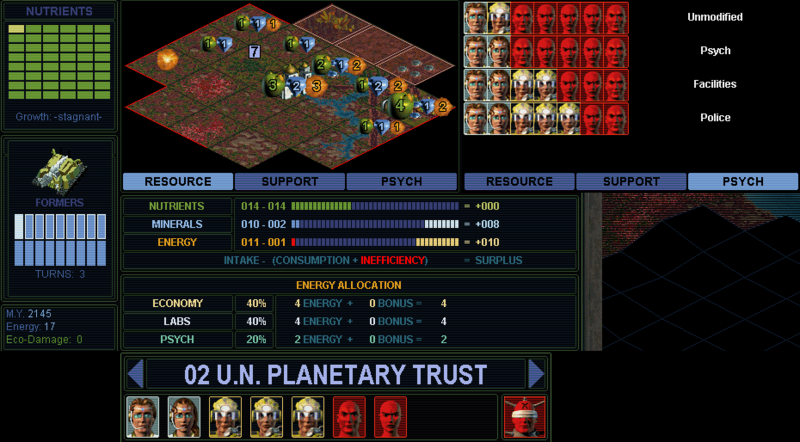 This is a writeup of a playthrough of Sid Meier's Alpha Centauri, with the United Nations Peacekeepers faction. This comes after my games with the Hive and Morgan Industries. I still wanted to do one more approach and writeup after those. The Hive game built densely with forty bases, and of course the Morgan game went drastically into ICS with over 70. I want to try out and demonstrate the converse of that, a smaller number of fully developed bases, quality rather than quantity. SMAC doesn't really have any significant "tall" versus "wide" debate; the correct answer is simply "both", as it is in most of the Civilization franchise; only Civ 5 really implements such a tradeoff. But there's still space to explore to see how it will go. Optimal strategy in SMAC always tends towards horizontal expansion as far as you can reach, then turn the corner and build up vertically. To do anything else requires defining some sort of variant rule. Of course the most drastic approach with fewer bases would be the One-City Challenge. But I didn't really want to go that far for this example. OCC is interesting and challenging and quite possible in SMAC, but actually turns out to be less fun than you might think. Optimizing the city is a nice puzzle, but the bottleneck becomes the limitation of one build item per turn. No matter how productive your base becomes, its single build queue still can't fit everything you need in buildings and defensive units and prototypes and crawlers and formers. Rather, this game will be another classic variant, a Five-City Challenge. 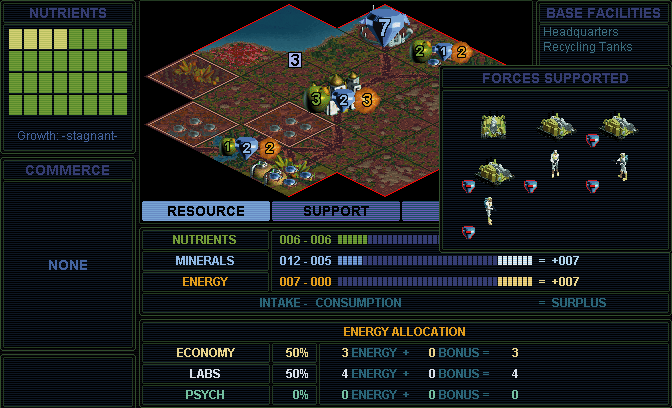 SMAC doesn't have in-game support to enforce that variant (only Civ 4 ever did), but it's easy enough to manage yourself. Since SMAC doesn't have an option to raze a base upon conquering (there is a command to obliterate, but it's an atrocity), the classic community rule for 5CC is a "soft" approach: you can temporarily conquer more bases if need be, but you must get minimal benefit and dispose of them as soon as feasible. I'll go with that; a hard 5CC is also possible, but the variant isn't meant to forbid you from conquering to get rid of a dangerous neighbor. The faction choice will be the United Nations Peacekeepers. Obviously the bigger habitation limit is exactly what you want with a limited number of bases, plus the extra talents will cushion the happiness situation. And this can be the fastest faction to population-boom, as I'll demonstrate. The PKs tend to be best at nothing but the second-best faction at everything besides warring. I would have played them for my introductory game writeup except that Haphazard on Realms Beyond was already doing them, so that's why I ended up playing the Hive instead then, but I like this faction and still wanted a chance to show it off. Same setup as the Hive and Morgan games: Base SMAC, not the expansion or any mods, Transcend (highest) difficulty, standard map size, low ocean for more room, standard erosion and rainfall and native life. Game settings: all victory conditions, no pod scattering, no random events, directed research. After a couple dozen restarts to look for a map roughly comparable to the Hive and Morgan starts, we begin here. One interesting item is the rocky-mineral bonus tile, which can be improved to a yield of 7 minerals even before restriction lifting. I mused in the Morgan game about the possibility of having such a tile from the beginning. I wasn't deliberately looking for exactly that, but it was certainly in mind to try out if I found a good chance. Besides that, we also have a flat-moist-nutrient bonus, plus a rolling-rainy-river and another rolling-rainy tile. Very good stuff. The downside compared to the other games is not starting on a river, but I also wanted to play through a situation without that to see how it would go. But finally, the key factor here is the two circled tiles in the blackness. There is a high chance of finding more tile bonuses there, probably around 50% for each. The map generator often tends to produce bonuses in this pinwheel pattern, same as in Civ 1 and 2, where four bonuses will be reachable from one central tile as marked by the blue dot. I moved one colony pod to the blue dot, the other south to see that circled tile, and the scout towards the eastern circle. I then planted my second base over on the river. It's close to UN HQ with six tiles of overlap, not optimally desirable for a limited city-count variant, but I can live with that much overlap if the rest of the bases don't. Base 02 is also at the center of a pinwheel bonus pattern, with possibilities in the two circled tiles. I didn't see the circled rocky tile until after the base built its scout to explore it. 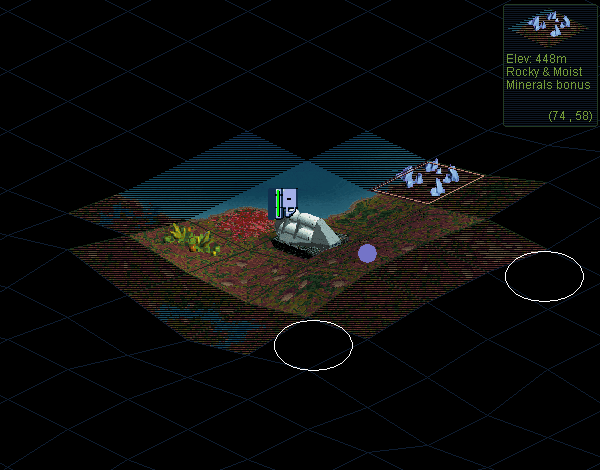 SMAC has an interesting behavior here that doesn't arise in any of the later Civ games: it is possible to found a base without seeing some of the tiles it can reach to work, and it can be significant effort to get a unit that way to reveal them. A little while later, when I built a former in the area, it did find an energy bonus on the westernmost circled tile. Base 02 now worked the rolling-rainy-river tile while UN HQ worked the 3-food nutrient bonus. I'd get the same labs towards Centauri Ecology either way, but UN HQ having been founded sooner would convert the food into growth sooner, so that was correct. The colony pod build orders shown here are not real; they are placeholders that would swap to terraformers as soon as we got the tech. Centauri Ecology completed in 2107; a turn slower than in even the economically-challenged Hive game, thanks to fewer river tiles. But it turned out (more coincidentally than intentionally) that UN HQ had reached exactly 10 minerals and I had exactly enough credits to rush the first former this same turn. 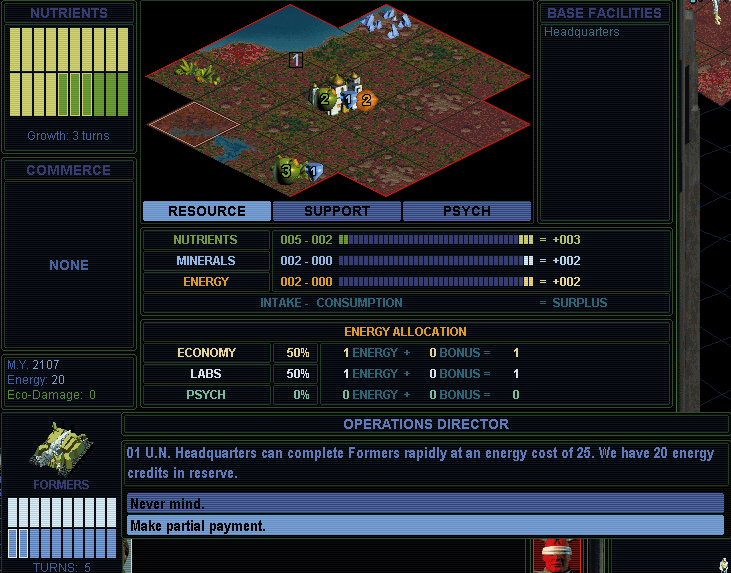 As how partial rushing always works, spending 20 out of the stated 25 credits gets 8 out of the 10 needed minerals, and the base's normal 2 production will complete it. That former headed directly to the big rocky mineral tile. 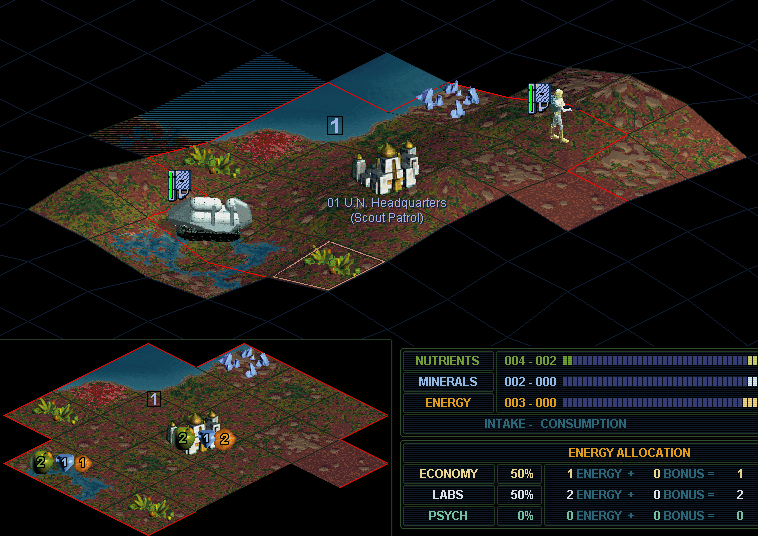 UN HQ grew to size 2 and started working that mineral tile even before it was improved, to build its first colony pod. Base 02 also rushed its former shortly later, then also started building a colony pod. My next research targets were Information Networks and Planetary Networks, to enable Planned economics. Not a lot happened during these quiet turns; the one notable event was that one scout encountered and killed a mind worm for an important 10 energy credits. Planetary Networks finished on turn 2121 (note that Morgan had already blown three techs further all the way to Industrial Automation faster than that!) 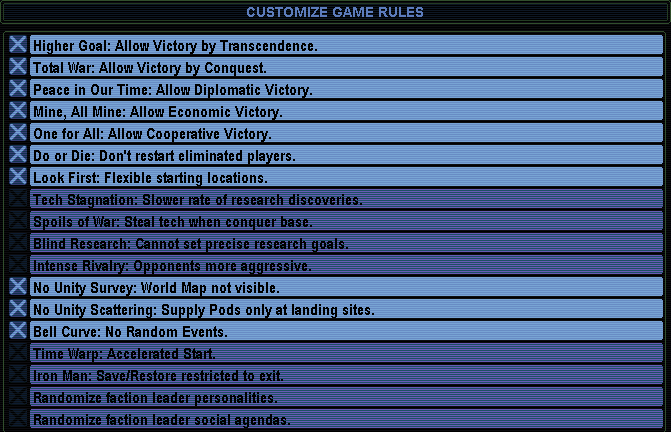 I had micromanaged the sliders to complete the tech labs and reach 40 credits to adopt Planned on the same turn. I precisely planned ahead to make full use of Planned economics immediately. I had intentionally stopped UN HQ at exactly 16 food, working the now-improved big mineral tile, knowing that the base would immediately grow the moment that Planned contracted the food box. Planetary Trust also planned ahead correctly: I brought the colony pod to exactly 27 minerals, to be completed the instant the Planned industry bonus kicked in on the mineral box, and also had exactly 16 food here to regrow right away too. UN HQ is now building Recycling Tanks. I downplayed that in the other games; the payoff is always just slightly not as good as more colony pods and formers. But this is indeed the right situation for them. I couldn't use more formers yet; they can't add more productivity when every population is already working an improved tile. I already had all the colony pods accounted for; I only needed to build three, of which two would come from base 02 since it was working more food to regrow quicker rather than the a big mineral tile. The important feature of the tanks is increasing productivity independently of any population. So 40 minerals for 1-1-1 did become the best option, better value than growing to size 3, which would be a cost of 30 food plus drone control plus terraforming labor for the next best possible tile (rolling-rainy-solar) for 0-1-2 net after the food consumption. So the best use of UN HQ's rocky minerals now was to build its recycling tanks. I'm not entirely sure where exactly the breakpoint is between more formers and the tanks, but I decided to do it like this: each base would build formers up to its two free support slots, then the tanks before any more units that would cost support. The first tank here finished in 2124. My formers were building a variety of improvements. Starting with the nutrient bonuses, where good underlying tiles (rolling-moist or rainy) got farmed, and bad ones (arid or flat) got forest. Then they started building several solar collectors, of all things. Two of my rolling-rainy tiles were over 1000m altitude, so the solar would add 2 energy, actually quite a big sum at this time. UN HQ would even pass up working the big mineral tile for a few turns to work a rolling-rainy-solar instead, both for the labs energy and for the food to get up to size 3. At this time the Peacekeepers' biggest advantage was kicking in. The free talent lets a PK base function at size 2 without having to do anything for drone control. That made a very noticeable difference, that I could build more formers and recycling tanks sooner, then a police unit (and pay its support!) only as the base grew to size 3. My next use of the big rocky mineral tile was for UN HQ to build and support the police units for all the other nearby bases. That's how to spread this base's superior productivity around to help the others. In a way, this was very roughly like an extra +1 support faction rating, at least for this limited number of bases. Moving ahead another few turns to 2130, here's the view with all five bases founded. Base 04 picked up some nice terrain too, centered in yet another bonus pinwheel; there's a food bonus under that former. Base 05 made me less happy, but that was the only other nutrient bonus anywhere around, and it could reach a few river tiles. The macro picture is that I'm sharing a medium-sized continent with the University and nobody else. Zakharov was hostile from our first contact. He had demanded and I had paid two tech demands immediately plus another some time later, which I could surmise accounted for most of his faction-dominance lead. I know we'll fight sometime, but I want to stave off actual vendetta here as long as I can, until I can afford some decent fighting units, and some probes to steal what may be quite a few techs. One thing I didn't realize was how crippling -3 Inefficiency is, with the PK's faction penalty on top of Planned. UN Aid Station was actually losing 100% of its energy, even at just 7 tiles distance from the HQ! Only the first two bases could contribute any amount of energy or labs, so at the moment my entire tech progress rested on their solar collectors being worked and under construction. But I was enacting a plan. My first major tech goal this time wasn't Industrial Automation for once, but rather Ethical Calculus. Democratic politics would counter the inefficiency of Planned. I could withstand the support penalty since I wasn't building new bases that needed the 10 startup minerals. But the star would be the growth bonus. I reached Social Psych in 2132 and Ethical Calculus in 2140. This was slow, 5 techs in 40 turns, even the Hive got 6 techs to Industrial Automation faster than that. But now it's time for my big plan. The Peacekeepers can embark on a population boom the fastest of all factions. I don't even need to wait for building the children's creches! Democratic + Planned + a Golden Age is also a valid combination for enough growth modifiers, and the PK's extra talents make the golden age quite easy. 80% psych was even enough rather than 100%. The bases are building Recreation Commons, much earlier than in my other games; that drone control is what we needed both to enable the golden age itself and to maintain order after booming. This plan was 60% successful. It worked for the three westernmost bases, which boomed up to size 7 in five turns. The other two bases didn't manage to join in the boom. The crater base couldn't get enough energy to put into psych, with no river, only a single solar collector, and its great distance which caused high inefficiency losses. And the Great Refuge base hadn't managed normal growth to size 3 yet to allow the golden age. But the three premier bases had now doubled my total population, vaulting me now to lead the faction dominance graph. I decided the best way to get the two lagging bases booming as well was to simply build the creches. The minerals of Garland Crater could do that quite quickly; and then I'd prefer to build/rush the creche at Great Refuge rather than waste a high psych slider to boom only one base. I'll skip the details of exactly how to manage the psych for the golden ages, but here are a few significant notes. Size 5 is usually the most critical step where it's the hardest to get more psych to keep going on a golden age, but it just so happens that the Peacekeepers' second talent (every 4 citizens rounded up) kicks in right then, so we easily kept going to size 7. Peacekeeper bases are allowed extra habitation up to size 9, but 7 was as high as I could get for the moment, for lack of both enough food and psych to get higher. Finally, I noticed that it didn't work to use doctors for more psych on top of the PK talents; what happens is that assigning a specialist replaces the talent citizen thus wasting it. The boom was strong, but didn't work miracles immediately. My economic productivity less than doubled, from 13 total energy+labs before the boom to 22 after. In fact, the last of the marginal population was actually negative value at this point, working unimproved tiles less productive than the 2 food and 2 psych needed to support the citizen. But now the bases had good power to build formers and sustain their support cost, which would repair this situation by planting forests.